There's nothing more summery than a pie! Well, that's what I think at least. A nice cool slice of pie topped with mounds of fluffy whipped cream or a big scoop of vanilla ice cream, doesn't the thought of it sound dreamy? Dream no longer folks. Make this pie and the reality is yours! This is quite possibly one of the easiest, but most delicious, pies I have ever made. You could even do without making your own crust and buy a pre-made crust (don't worry, I won't tell). What I love about this pie is that only 1/4 of the berries are cooked while the rest are folded in later, untouched and impossibly fresh. This pie isn't too sweet, and bursts in your mouth with every bite. It really is spectacular! Oh, and the filling to this pie stands really well! After letting the pie rest, the pie slices soooo nicely and doesn't goop and gush all over the place, which is nice for a change! I didn't have enough blueberries on hand so I used a mixture of blueberries and blackberries, and by gosh was it fantastic! This was a new pie crust recipe I tried, which though I did like, I prefer the one I used here better. This pie crust was not as flaky and more cookie-ish. So depending on your preference, you can use either one. Had to have that gratuitous innards shot! To make the pie crust, combine the flour, sugar, salt and baking powder in a food processor. Pulse a few times to combine. Add the butter and pulse until the mixture resembles coarse meal or large peas. Add 3 tbsn. of water and pulse until the dough begins to form a ball; you may need to add more water if dry. Turn out into a lightly floured surface and gather it into a ball. Divide the dough in half and gently pat each half into a disc. Wrap in plastic wrap and refrigerate for at least 30 minutes before rolling. Roll out the crust, large enough to fit your pie tin. Transfer to the pie tin, cutting off the excess and crimping the edges. Let chill in the refrigerator before baking for 15 - 30 minutes to prevent shrinking. To bake, preheat the oven to 350 F. Line the pie shell with parchment paper or foil and fill with pie weights. Bake for 25 - 30 minutes covered, then remove the pie weights and liner and bake until lightly golden, about 10 - 15 minutes more. Cool completely on a wire rack before filling. To make the filling, measure out 1 cup of blueberries, choosing the softest ones. Place them in a medium saucepan with the 1/2 cup of water. Cover and bring them to a boil. Meanwhile, in a small bowl, whisk together the cornstarch and remaining 2 tbsn. water, set it aside. 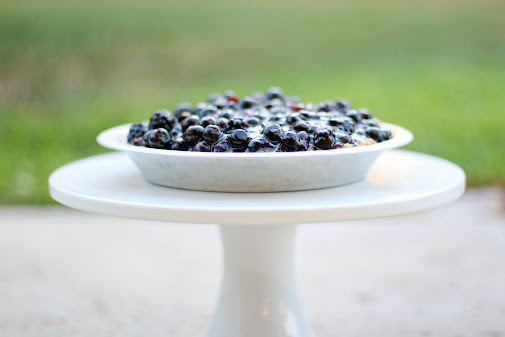 When the water and blueberries have come to a boil, lower the heat and simmer, stirring constantly for 3 - 4 minutes or until the blueberries start to burst and the juices begin to thicken. Stirring constantly, add the cornstarch mixture, sugar, lemon juice and salt. Simmer for a minute or until the mixture becomes translucent. 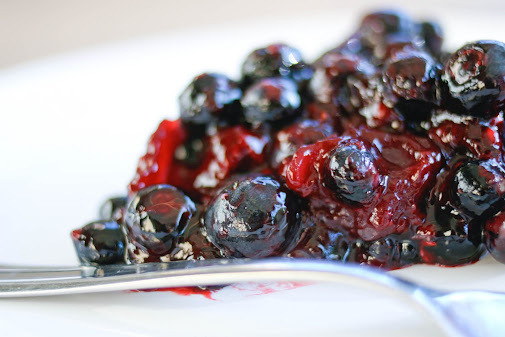 Immediately remove it from the heat and quickly fold in the remaining 3 cups of blueberries. 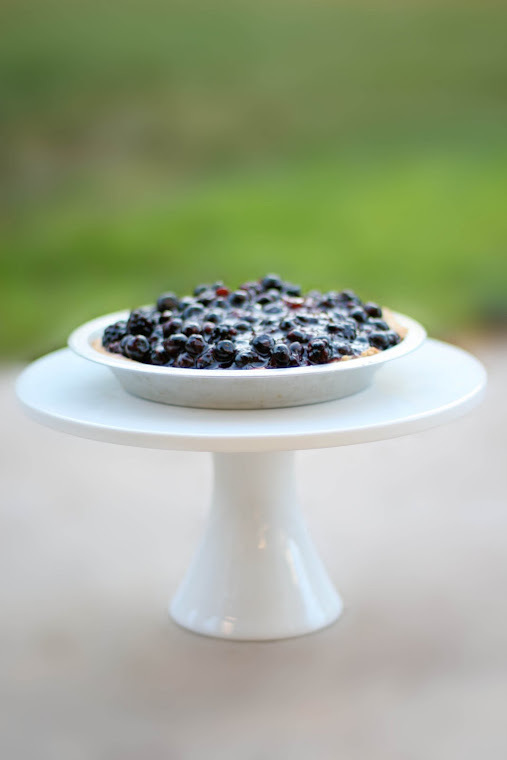 Spoon the mixture into the baked pie shell and allow to sit at room temperature for at least 2 hours before serving. 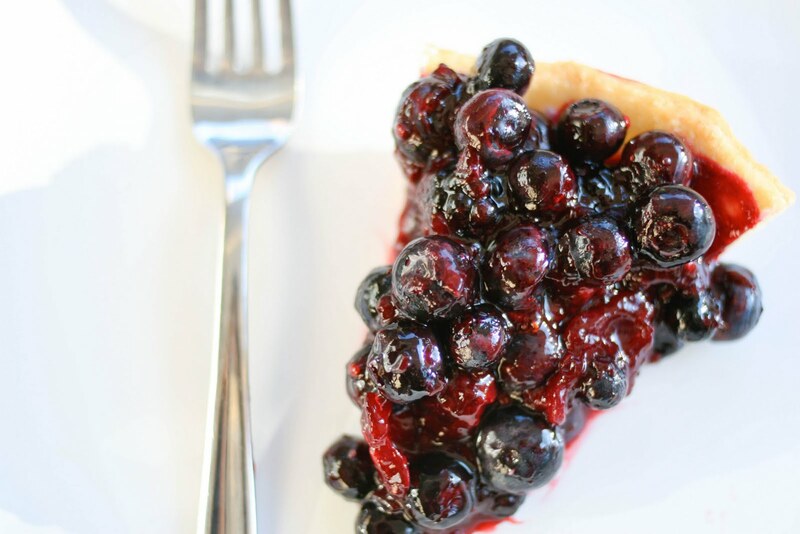 When set, the berries will remain juicy but will not flow out of the crust. Just before serving, if desired, pipe or spread the whipped cream around the sides of the pie, leaving the center unadorned. What a byooot! I actually have this book and can't believe I haven't tried it yet. Bookmarked! yum-o-licious! this looks amazing. i have been hoarding blueberry's all summer. i have a huge stash in the freezer. can't wait to make this! this looks awesome! but, maybe I'm just missing it, where do you need the Tbs of egg white in the pie? Maybe it's my computer,but your font is minute. I can enlarge the page enough to read it, but I wanted you to know.. but, again, maybe it's just me?? OMG.....I NEED to make that! Thanks for sharing! Oh what a pretty pie!! I made blackberry pie bars very similar to these and they are one of my favorite treats.